“Two years ago when Neil Raphael was 10 years old and told his father, local author-teacher Ray Raphael, that he wanted to co-author a book with him, the response he got at first was less than enthusiastic. As soon as they started tossing ideas around, they found themselves on a roll. Neil said that almost every morning during breakfast and every evening while getting dinner ready, they’d “brainstorm ideas and jot them down.” They’d do the actual writing on weekends when they’d sit down at the computer for two or three hour writing sessions each day. At a comic book convention in a fancy San Francisco hotel, Conrad see a man dressed in a Mickey Mouse costume pull a gun on someone dressed in a Superman costume. 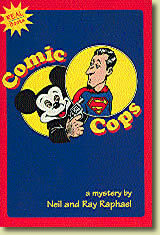 Figuring the cops wouldn’t believe him if he told them he’d just seen Mickey Mouse pull a gun on Superman, Conrad, along with his cohorts Billy and Susan, sets out to solve the mystery of who is the real Mickey Mouse and what does he want from Superman? After the book was written, they decided to publish and market it themselves. So they were involved in every part of its making, from the book design to the style of font and even the type of paper. For Neil it was a complete learning experience. Asked if he plans to write books for a living, Neil said, “I’ll probably write one book, but I can see how hard it is to make a living as an author from my dad’s experience.